Once again on the eve of Independence Day, Pakistani hackers are continuously hacking into the Indian server. After the mass cyber attack on Indian Server, defacing 6 thousand site, again Pakistani hacker hacked the official site of Mahanagar Telephone Nigam Limited MTNL Mumbai (http://mtnlmumbai.in/‎). Hacker name as Mr.Creepy member of Napster crew, Pakistani hacker group have breached the security of the MTNL mumbai and defaced its home page. 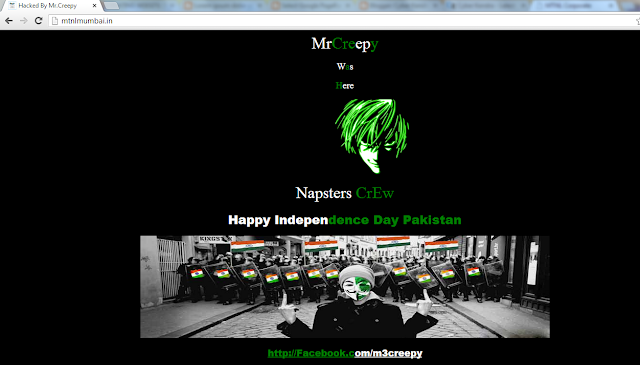 On the deaface page hacker wrote "Happy Independence Day Pakistan". Along with this Pune Traffic Police site was also hacked by the same hacker. This hacking and defacing is just converting into cyber war between two countries.